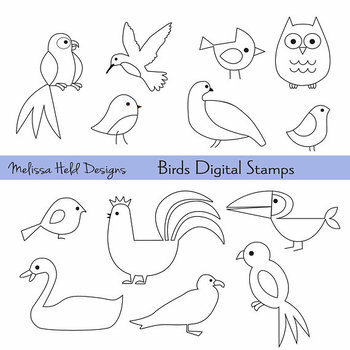 This is a clipart collection of all types of birds in black outline by Melissa Held Designs. You can use these icons to create patterns for embroidery projects, as easy to print teaching resources, to create your own coloring books, paper crafts, and scrapbooking. This includes a wide variety of birds including seagull, parrot, owl, duck, rooster, toucan, pheasant, hummingbird, and cardinal. These images have a black outline with white fill on transparent backgrounds. There are 13 PNG stamps included in this set.